I want to thank Comic Strip Of The Day for their post today which included one of my cartoons. Mike Peterson, the owner and writer of the site, made some really nice comments about my cartoon on sanctioning Russia. 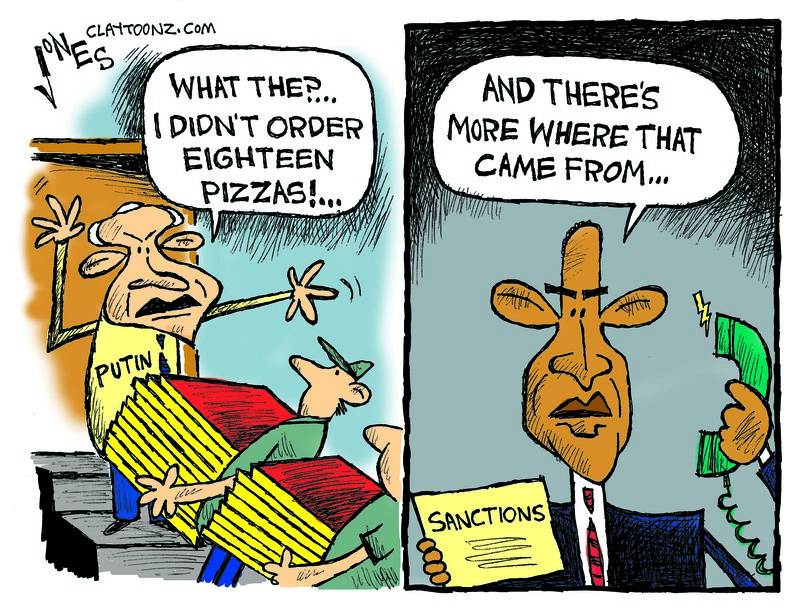 With the exception of Clay Jones, who offered an amusing and pointed commentary on the puzzlingly limited set of sanctions announced yesterday. And to be clear: What makes his commentary stand out is that he goes beyond railing against general ineffectiveness and hones in on the limitations of what has been done. There is, in his mockery, a suggestion that sanctions are a legitimate response but that the ones which are going into place are not sufficiently sweeping or punitive to be more than a petty annoyance. I don’t expect a political cartoon to project a 12-point plan, but Jones has done more than others. Which is good, but it does still kind of make him the pony under the pile. At least there was a pony. Incidentally, Clay is back after a period of inactivity following his layoff from his newspaper, and is not only actively self-syndicating but has got a spot at GoComics. Good news for him, yes, but also encouraging for the medium as a whole.